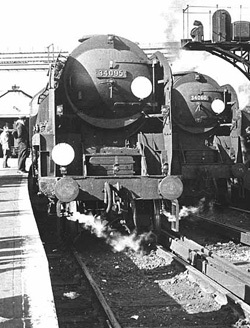 Steam, Sheds, Railways etc... Free discussion to open members. JOIN TODAY!! The overhaul of Hartland would look to be well under way. The sections / fabrications for the firebox / boiler are in hand and the repair looks to be as extensive if not more than Taw Valley's boiler requires. The loco frames are in the repair shop being cleaned and painted prior to reassembly. Hopefully someone can bring us a little more up to date on progress? 35012 wrote: The overhaul of Hartland would look to be well under way. The sections / fabrications for the firebox / boiler are in hand and the repair looks to be as extensive if not more than Taw Valley's boiler requires. The loco frames are in the repair shop being cleaned and painted prior to reassembly. If this is the case for the loco and it is more extensive than first thought and with the problems that were found with Taw Valley. Then I can't see this loco steaming in the near future. Of course this all depends on what volunteers they have available for a quick turn-around. "Seeking the answers to life's problems, and the search for ultimate knowledge that is self-knowledge"
Location : Sussex, But Imagining 70A or Ropley MPD. I think Hartland will be turned round in reasonable time after all the NYMR now have the benefit of seeing what was discovered on Taw Valley, this probably explains the belt and braces approach being taken with Hartlands boiler / firebox. I have found this following information on 34101 which says as follows: "34101 —- Boiler: New inner firebox being fabricated. Boiler rebuild to commence on completion of 75029 . Frames on stands in repair shop for descaling , painting, re-assembly. All wheels out ready for tyre turning"
Does anyone have the latest news regarding 34101? I have heard that she is due to Steam sometime this year from what has been discussed on SEMg Online? But what is happening with the overhaul and does anyone know when she is expected back into traffic.... To me it looks like it might be some time yet and looks as if work has come to a stop? Hi. Just back from Grosmont MPD and can confirm that work is continuing on the boiler. This is an extensive boiler overhaul and much work still needs to be done. The bottom end is largely complete and awaits the boiler when is finished. Looks like sometime next year for recommissioning. Does anyone have any updates on Hartlands Overhaul Please? Any Pictures or news anywhere would be very much appreciated.